As Leader of the Opposition in the National Assembly (NA) Khursheed Shah called on lawmakers to present a united front against the "barbaric" lynching of Mardan university student Mashal Khan over alleged blasphemy, MNAs passed a unanimous resolution condemning Khan's murder on Tuesday. 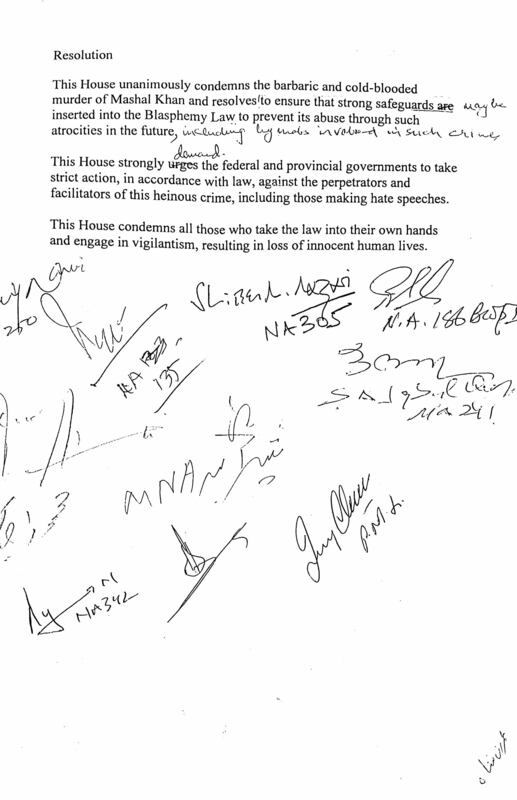 The resolution called for effective measures to ensure that the blasphemy law is not misused, including the imposition of "strong safeguards" into the blasphemy law "to prevent its abuse through such atrocities in the future including by mobs involved in such crimes", the resolution. Lawmakers demanded the federal and provincial governments take strict action in accordance with law against the perpetrators and the facilitators of the lynching of Mashal Khan, including those propagating hate speech. Prime Minister Nawaz Sharif's condemnation of the lynching came two days after the horrific incident. Shah termed the democratic government's prerogative to complete its tenure a "ball and chain". "We can stand behind a dead democratic government but not behind a dictatorship," he said. "We do not want to see the leader of the country in a weak position," Shah maintained, cautioning lawmakers that "to comment on the country's institutions is dangerous."